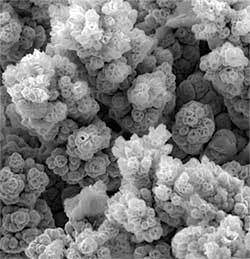 (Nanowerk News) Researchers at KTH Royal Institute of Technology have successfully tested a new material that can be used for cheap and large-scale production of hydrogen – a promising alternative to fossil fuel. "The new alloy can be used to split water into hydrogen,” says researcher Peili Zhang. “This catalyst becomes more efficient than the technologies available today, and significantly cheaper. “This technology could enable a large-scale hydrogen production economy,” he says. Hydrogen can be used for example to reduce carbon dioxide from steel production or to produce diesel and aircraft fuel. It’s not the first time a cheaper material has been proposed for water splitting, but the researchers argue that their solution is more effective than others. They published their results recently in the scientific journal Nature Communication ("Dendritic core-shell nickel-iron-copper metal/metal oxide electrode for efficient electrocatalytic water oxidation"). Sun has previously made progress in this field of research, including the construction of artificial photosynthesis (Nature Chem. 4/2012), and a catalyst based on nickel and vanadium (Nature Com. 7/2016). His and colleagues' research was one of the reasons that US President Barack Obama went to KTH in 2013 during the second-ever state visit of an American president in Sweden.